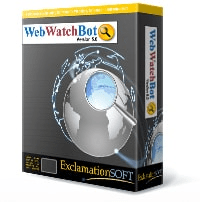 ATTENTION: Support for WebWatchBot version 6 ended on February 29, 2016 and version 7 ends on May 1, 2018. Upgrade today and continue to receive support and upgrades for one full year. Monitor the round trip of an email through new mail server types (IMAP, IMAPS, and SMTPS) and existing mail server types (SMTP, POP3). Email Round Trip (ERT) allows monitoring of availability and performance of an end-to-end email delivery process, to ensure that your incoming and outgoing email services are working properly, and emails are sent and delivered within the time expected. The Monitoring of an IMAP (Internet Message Access Protocol) mail server ensures that connections can be successfully established and actions are carried out within the time expected. The Monitoring of an IMAPS (Internet Message Access Protocol Secure) mail server ensures that connections can be successfully established and actions are carried out within the time expected. This watch type allows monitoring of an SMTPS (Simple Mail Transfer Protocol Secure) mail server to ensure that connections can be successfully established, to monitor Response Time, and to verify transactions between the monitor and the mail server. Database Watch Type: Added option for reverse search, to trigger failure if the search text is NOT found. Install: New dialog allowing selection of Windows user account for the WebWatchBot Service (WWBServer), either Local SYSTEM account or a specified user account. Corrected SQL Server setup script for compatibility with non-English installations. Removed "Sound" alert action, due to compatibility issues with some versions of Windows. This feature was only available when running in non-service mode, which is used by a small segment of the user base. After running a report, e.g. performance report, an error occurs. The error message in the event log shows: "Error: -2147217913 Msg: IDispatch error #3079 Description: [Microsoft][SQL Server Native Client 10.0][SQL Server]The conversion of a varchar data type to a datetime data type resulted in an out-of-range value. Error 1 of 2)", date format dd/mm/yyyy causes error. Fixed. Watch Items with dependencies send multiple email alerts after an alarm is reset. Fixed. Fixed issue with changes to escalation rules overwriting Watch Item that are NOT using escalation rules. Resolved issue with email alert formatting and text inaccuracies for Watch Items with dependencies. There were issues with background color, and information on the cause of alarm trigger and reset. Resolved issue with email alert downtime reporting for Watch Items with dependendies. Reported downtime was based on base Watch Item and not dependent Watch Item. Modified "Send Full/Short Report" for updated website. Resolved issue with Import/Export: Importing from previous version would import Watch Items, but the log file would not load until WebWatchBot restart. Statistics would not update until WWBUpgrade.exe was executed. PING: If using "Dart" ping component, an internal timeout is set to the maximum response time even when "timeout" checkbox in the Watch Item properties is not checked. Changed so that the minimum timeout is 1000ms or the maximum response time set, whichever is higher. Web Client: Fixed issue with log files not displaying on the Manager page. Copying a Watch Item, selecting "Yes" or "Yes to All" to the prompt to open the Watch Item properties after copying causes crash. Fixed. Event Log Watch Types not retrieving error when failed to connect. Fixed so that the last error is shown in output and logged. Reports: Uptime/Downtime for All Watch Items: report heading and chart numbers were not matching. Fixed. Reports: Uptime/Downtime chart. Changed value for pie chart to use total number of seconds and not minutes. Using the later, would at times, show incorrect percentages. Suspending and Activating large number of Watch Items will perform faster. Reports: No summary data produced or incorrect computations for reports for "All Watch Items" on installations with very large databases. Better handling of error conditions with service failing to start. Detection of threads not starting properly. Fix bug where certain HTTP pages would return HTTP 400 because of request for gzip compression when it is not needed. Configure a Watch Item or Transaction to be dependent on one or more Watch Items or Transactions. Based on the status (UP or DOWN) of those dependencies, take action: suspend/activate the Watch Item or Transaction, or trigger/reset an alert action, e.g. send an email alert. WebWatchBot adds support for SFTP at the request of numerous customers, allowing you to monitor secure FTP servers via SSL protocol. During installation, new dialog for Windows user account to assign to WebWatchBot service (WWBServer) and the WebWatchBot application pool in IIS. Streamlines the configuration process and reduces errors. Import error with export list from versions prior to version 7. Popup notification window will close automatically when connectivity is restored since the dialog should not need to be closed explicitly. Extended the Custom Watch Type's field "CustomCommand" to accept longer command strings. Changed WWBUpgrade to use registry settings for SQL command timeout. Was being ignored and the install script would timeout after 2 minutes. During database maintenance, if the backup fails, a warning is issued instead of failing maintenence completely. Fix for HTTP error 12019, ERROR_INTERNET_INCORRECT_HANDLE_STATE which means a corruption during HTTP Post of data which can happen intermittently under rare circumstances. Fix statistics not being updated after a Watch Item or Transaction is imported. Caused by database tables not being aligned during import. Changed frequency of authorizing the service application from once every 15 minutes to once every 24 hours after startup. This will reduce the number of times that authorizing can potentially fail and cause a service restart. During install, when the service cannot connect to the db, improve the error message to better troubleshoot. During uninstall, user is prompted to stop the WebWatchBot service. Creating a new Watch Item, would not start the Watch Item until the service is restarted or the Watch Item is suspended and activated. Occurs only in 7.0 Beta 1. Import error with export list from versions prior to version 6.5. Explorer View – Create, edit, delete, run, suspend, activate, and view the last output of Watch Items and Transactions. Watch Items or Transactions from another WebWatchBot database! New component for PING Watch Type that provides results that more closely match Windows ping. Introducing, WebWatchBot WS (Web Services). A way to connect to the internals of WebWatchBot. First supported web method is DisableCheck, which allows for a Watch Item to be suspended and activated. Added new Transactions setting "Persist Form Data" which will persist selected form variable values from the previous step. New settings window allows for the input of form variable names. When the Transaction is run, the specified form variables value will be saved from the previous step. Repeat Alarm Action. New option in Watch Item/Transaction properties, Alarm tab. When enabled, an alarm trigger action is repeated until the alarm is reset. New option for Transaction Recorder: Remove __VIEWSTATE hidden variable automatically. When set, the hidden form variable __VIEWSTATE is removed when recording a Transaction. This experimental option was added for some web applications that do not allow the reuse of __VIEWSTATE. "All Watch Items" scheduled maintenance is suggested after install to run daily for 20 minutes. Proxy exception field expanded to accept the maximum length (16383 characters) allowed by Windows.